Above: Ariel Lin with Vin Zhang for I Will Never Let You Go (2019). There is no contesting that Ariel Lin (林依晨) is the queen of dramas. Ever since 2003’s My Secret Garden <我的秘密花園>, Ariel has proven that she is the long-standing queen of television. Every romantic comedy that she has starred in end up becoming huge trendsetters for the industry. While it’s true that dramas featuring Ariel tend to become very popular, the 36-year-old has also managed to do one other thing—bring fame to her male costars. Many of Ariel’s male costars end up with successful careers after collaborating with her, including Marcus Chang (張天霖) from 2003’s My Secret Garden, Mike Ho (賀軍翔) from 2004’s Love Contract <愛情合約>, and Joe Cheng (鄭元暢) from 2005’s It Started with a Kiss <惡作劇之吻>. Her collaboration with Wu Chun (吳尊) in 2006’s Tokyo Juliet <東方茱麗葉> kickstarted the Fahrenheit (飛輪海) member’s television career as a leading actor, and 2011’s In Time with You <我可能不會愛你> revived Chen Bo-lin’s (陳柏霖) stagnating career. 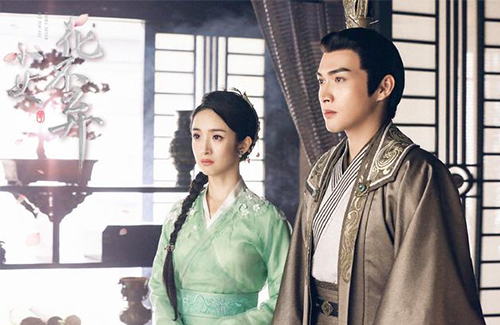 William Feng (馮紹峰) went through another popularity boost after starring alongside Ariel in Prince of Lan Ling <蘭陵王>. In 2018, Ariel collaborated with Liu Ye (劉燁) for Old Boy <老男孩>, which broke 100 million views within three days. And now, in 2019, Ariel Lin’s comeback drama I Will Never Let You Go <小女花不棄> is pushing her costar Vin Zhang (張彬彬) to new heights in his career.